Set high in the heart of Italy, the Abruzzo is a region of spectacular mountains and medieval ruins, of ancient forests and lush mountain fields. Into this wild and beautiful place Mario Valentini was born. With money short after the Second World War, at the age of just four Mario was sent to live with his uncle, a travelling priest. And so began a life of unusual freedom and wondrous adventures, roaming mountains and hilltop villages at a time when soccer balls were made from paper and wheat was cut by hand. From meeting hungry wolves at dusk, to collapsing intoxicated inside a gigantic wine barrel and impersonating his uncle in the confessional, Chewing Gum in Holy Water shines with the exuberant daring of Mario’s childhood. As he grows our young hero learns that life’s lessons can come from the most of unexpected places: be it his caustic aunt, the communist who eats priests, an illusive and alluring young principessa or the irreverent wit, passion and endurance of the Abruzzo villagers. Ever-present are the scents and tastes of the region: the smell of bubbling quince and roasting nuts from the nuns’ kitchen; the crisp, smoky crusts used to seal the village oven; and the tantalising squares of golden polenta oozing tomato, garlic and oil that are Mario’s breakfast. 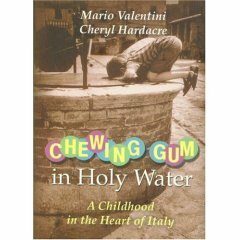 With an uncomplicated joy for life Chewing Gum in Holy Water is a truly original tale, reminiscent of a time that was simpler and somehow richer. My husbands father grew up in one of the Abruzzi towns(fossa) at the same time as Mario Valentini. The house he grew up in is still in the family-and it is such as magical place!! Purchased this book(for a birthday gift for my husband) from EBay; because I had trouble locating it elsewhere. Can’t wait to read it after him!! Wow, isn’t it a small world? !